It’s the middle of March, meaning I’m well into the seventh month of my McDermott internship, and I have to say that the charms of working in a museum still haven’t worn away. I don’t know that they ever will! Part of what I love so much about my position as part of the Family and Access Teaching team is that I have gallery time built into my schedule. I’m out in the galleries multiple times a day: teaching classes, leading occasional tours, doing research for lesson plans (and blog posts! ), and taking walks as a break from my desk. After each trip through the Museum, the thought creeps into my head that, “Okay, now I’ve seen everything we have on view,” and yet time and again I’m proven wrong. Without fail, there’s always something I haven’t noticed before – something I have to stop in front of and think, “Has that always been there?” before investigating. The piece is often small or–at first glance–plain. Frederic Edwin Church’s Icebergs certainly isn’t a piece you can miss, nor is everyone’s favorite rain god, Tlaloc. These are the pieces that can catch your eye from a mile away. Today, however, I’m here to encourage you to spend a little extra time in the corners you might normally overlook, by sharing a few pieces that I passed by on so many occasions and have now come to admire. 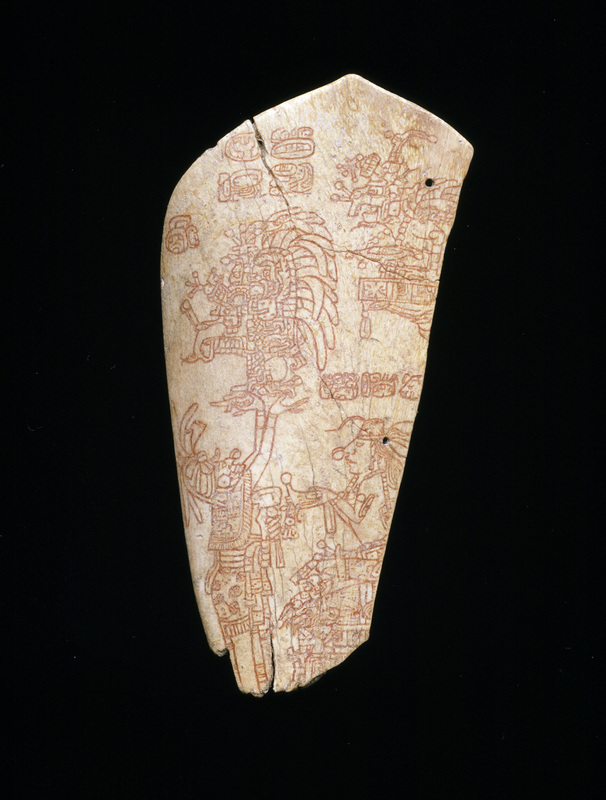 This fragment of bone, only 3 1/4 inches tall, was meticulously incised over a millennium ago with the scene of a young man being crowned king. The about-to-be ruler sits in the lower right of the piece, and opposite him a man raises “the great headdress of Holy Lordship,”which, according to the Museum’s label, bears the image of a mythical bird called ‘Itzam-Yeh,’ ‘The Magic Giver.’ The significance of Itzam-Yeh’s presence in this scene is rooted in the story of the bird; in short, he claimed to be something much greater than he was and was found out and punished for it. The headdress, so decorated, would serve both as a reminder and a warning to the new king. This chess piece, made of gilt and polychrome ivory, is another incredible work of delicate craftsmanship. 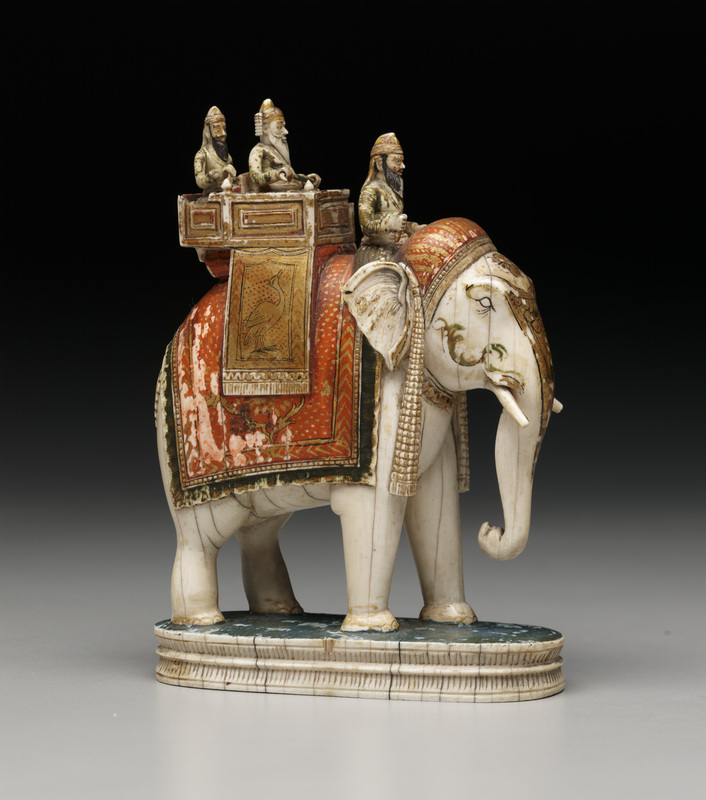 The details are what make the piece so impressive–for example, each of the three men riding the elephant have distinct features and carefully carved beards. Some of the fine black lines are so thin and precise that they would have required a very steady hand wielding a paintbrush with no more than a strand or two of hair. This particular piece would have been used as the king–can you imagine how grand the entire chess set must have looked? 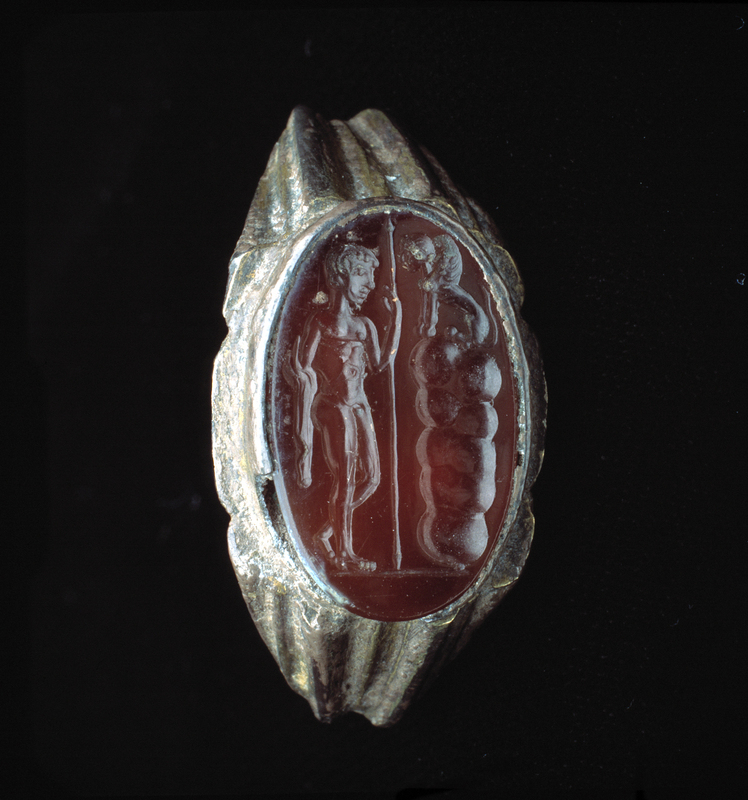 Ring with engraved carnelian, Roman, first half of 3rd century A.D. This silver ring was probably worn by a man. In the gallery, the ring is so small and the carving is so fine that the details can be hard to see without careful, close looking (the Museum’s online collection comes in handy during moments like this–there are many high-quality photographs that let you zoom in and examine a small piece like this ring with ease). To the left stands Oedipus, the king in Greek mythology who murdered his father and married his mother, unaware that they were his parents. Carved into the Museum’s carnelian is a scene from later in his story when Oedipus saves Thebes from the Sphinx by answering her riddle. The craftsman that made this exceptionally small carving was clearly remarkably skilled–I can’t imagine the patience and quiet attention that went into the creation of this ring. These are just three of the small, wonderful pieces I’ve discovered in the galleries, and I can’t wait to see what I run across next. So remember: on your next trip to the Museum (or any museum) yes, you absolutely should pay attention to the standout pieces–the Icebergs, the Tlalocs–but don’t forget to give the little guys their due. You’re bound to be surprised by what you find. ← A Color Spectrum of Fun!